Is your company really creating wealth? Lots of big and small companies don't. Find your magic number, then see if you're focusing on the right projects. SAN ANTONIO (FSB Magazine) -- From almost every angle, it looked like one sweet deal. Morgan Stanley was seeking a company to host a massive software program designed to digest stock market data. Among the candidates for the job was a little-known firm with big ambitions, Rackspace Managed Hosting, based in San Antonio (rackspace.com). 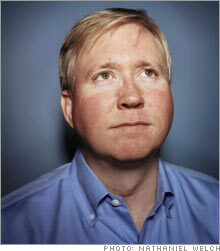 Truth seeker: CEO Graham Weston has grown Rackspace by focusing on "true" profit. The project promised to be a blockbuster: $20 million in revenue over two years and the chance to work for a respected giant on Wall Street, an enticing opportunity for a small company whose plans for an IPO evaporated during the dot-com bust of 2001. "Do this deal," Morgan Stanley (Charts) executives urged Rackspace. "We'll put you on the map!" Not too many young companies eager to break into the big time would take a pass on such a project, but Rackspace did. After a wrenching series of meetings with his top executives last summer, CEO Graham Weston decided against it - despite intense pressure from the sales team and from a major supplier, Dell (Charts), which stood to score a $13 million sale providing the 3,000 new servers Rackspace would have needed to host Morgan Stanley's data. Weston took a lot of heat for his decision but held firm. "We could have made a profit on this deal, but not enough to risk our capital," he says. "We are 100 percent committed to making a true profit." That concept, true profit, is a religion at Rackspace, and Weston preaches it with the passion of a zealot. Like most religions, it is based on a very basic principle: Create new wealth. Rackspace defines true profit as a company's operating profit (after taxes) minus its total annual cost of capital. Sounds elementary, but there's a twist. The cost of capital includes not only borrowed money, which is usually relatively inexpensive, but also the far more costly capital contributed by investors and shareholders. Essentially Rackspace's magic number is 15 percent - any profit margin lower than that is unacceptable. Calculator: What's your company's true profit? Rackspace isn't the first company to employ true profit. It's based on a metric known as economic value added, or EVA, which Manhattan-based consulting firm Stern Stewart & Co. (sternstewart.com) developed in the late 1980s. EVA became popular in corporate America in that decade, and capital-intensive companies such as Coca-Cola (Charts) used it to hold their profit-and-loss statements to a higher standard - and thus attract interest from investors. What's different now is that small companies are increasingly tailoring versions of the idea to fit their needs. "We've implemented EVA programs in 350 companies, 20 percent of them small businesses," says Bennett Stewart, co-founder of Stern Stewart. "It transcends every industry: transportation, food, consumer products, oil and gas, real estate. Law firms can benefit; so can franchisees. The only companies that wouldn't benefit are venture capital-based startups, where everything is in flux." Weber-Stephen Products (weber.com), a maker of cooking grills and accessories in Palatine, Ill., instituted EVA five or six years ago, and executives say the concept has been a factor in its recent success. "EVA gives employees more information and helps them look at the company from the same perspective as shareholders," says Leonard S. Gryn, CFO at Weber-Stephen. At Rackspace, Weston brought in Stern Stewart two years ago to develop the concept for his company and liked the results so much that he hired the lead consultant full-time. Today every deal - indeed, every major business decision - is tested against the principle of true profit. Weston has set the bar high, putting the cost of equity capital at 15 percent. That forces a strict and sometimes painful financial discipline on the company. Weston has taken a pass on some compelling opportunities - and pulled the plug on others - because they didn't pass the true-profit test. Last year, for instance, Rackspace sold off a fast-growing, moneymaking subsidiary because the new venture didn't generate enough money to clear the hurdle. Technology decisions are tied to true profit. So is compensation. Everyone at Rackspace has had to embrace the new faith - or go: A few executives have lost their jobs because they couldn't quite see the light. "True profit keeps us honest," Weston says. "It leads us not into temptation." Weston's faith is reaping big rewards for Rackspace. Scores of companies in the savagely competitive Web-hosting business have been driven into bankruptcy or have simply disappeared since the dot-com bust of 2000. Rackspace has not only survived but thrived. This year it is likely to vault over divisions of such corporate behemoths as AT&T (Charts) and Verizon (Charts) to become the second-largest Web-hosting company in the U.S., according to Gartner Group, a market researcher. Rackspace posted net income of $9 million on revenues of $140 million in 2005. Weston says revenues will probably top $210 million in 2006, the company's eighth consecutive year of double-digit growth. If true profit is just a hellfire version of Finance 101, then why does it sound so profound? Earning more than the cost of capital is, after all, the bedrock principle of capitalism. Theoretically, it is enforced by a kind of economic Darwinism: Companies that don't make more than their cost of capital are supposed to fail. In reality, that's rarely the case: Lots of big corporations don't make a true profit. That is equally true of small businesses, which can be so desperate to close deals early on that they neglect to really look at the numbers. As a result, line managers are clueless about the cost of capital and the returns - or the lack thereof - they are generating. Not at Rackspace. From top management down through the ranks, the entire company understands and adheres to the discipline of true profit. The 1,100-member workforce is divided into teams organized around groups of customers. Each team is composed of salespeople, service technicians and billing specialists, all overseen by an account manager. Teams operate almost like business units, with wide latitude to woo new customers, purchase servers and price their Web-hosting services. (About half of the company's sales come from small-business clients.) The bottom line: Every team has to meet or beat the magic number. The company's true-profit focus has helped Rackspace avoid some of the dangers of rapid growth. The Morgan Stanley deal is an example. Hosting its massive software program would have been a big boost for Rackspace in some respects. Morgan Stanley was offering $10 million a year for two years. Having a big, prestigious bank as a client would have opened a lot of doors for tiny Rackspace in the Fortune 500. Weston had considered an IPO, and a relationship with one of the nation's most powerful investment banks would have been an asset. After crunching the numbers, Weston says, Rackspace realized it would have cleared less than 10 percent a year on the deal - not enough to cover its cost of capital. Sharp pencils have been the rule at Rackspace almost since its founding. Launched by three college students out of their dorm rooms at Trinity University in San Antonio, the company was one of hundreds that sprang up to offer Web-hosting services in the late 1990s. While working on a project, the trio - two of whom are still with the company - met Graham Weston. Then 34, Weston had already achieved a bit of local notoriety for savvy dealmaking: In the early 1990s, during one of the biggest real estate busts in Texas, Weston and a group of investors bought a 500,000-square-foot trophy building, the tallest in downtown San Antonio, for $40 million from Citibank, which had foreclosed on the property. Today the building's worth is estimated to be $65 million. Then came the crash. By the fall of 2000, Rackspace had barely enough money in the bank to sustain the company for three months. Weston cut expenses to the bone and issued an ultimatum: Rackspace had one year to build a profitable business or it would be shut down. Desperate, managers forged a new business plan. Richer rivals continued spending lavishly, building costly data centers to handle the anticipated boom in the Web-hosting business. Slowly the business grew. By 2002 the company's data center in San Antonio was crammed with servers, and the company desperately needed more room. But executives were wary. New construction would have guzzled precious capital, requiring debt or a new infusion of money from investors. Weston scored another real estate coup. A competitor desperate for cash was selling assets, among them a new state-of-the-art data center just outside Dallas. Designed with bullet- and bomb-proof walls, the center was rumored to be more secure than Fort Knox and to have cost about $50 million. Rackspace paid $2 million. "We've refined the just-in-time management strategy," Weston quips. "We call it just-barely-in-time." By 2002, Weston realized that his natural frugality and his urge to protect his equity would be a brake on the growing company for only so long. He wanted every employee to think like an investor with money at risk. So he brought in strategy gurus from Stern Stewart. Together they refined the true-profit concept for a small, entrepreneurial, privately held company and embedded it in every aspect of operations. The Stern Stewart consultant, Karl Pichler, is now vice president of finance at Rackspace. The change in mindset started paying off right away. In 2003, Rackspace launched a program called Server Beach, which offered no-frills hosting of very small Web sites for a monthly service fee of $99. Within months, the new unit was growing faster than its parent, generating $600,000 a month in new revenue and $150,000 in cash flow with a workforce of only 30. Even so, Weston began to suspect the new unit was a fool's game. Customers switched hosts just to save a few pennies a month on fees, and the marketing costs to bring in new clients were high. Rackspace had to keep pouring money into buying new servers; new customers objected to having their sites hosted on old servers. The bottom line: Server Beach was delivering a minimal return on its capital. "Thinking in terms of true profit quickly illuminates a problem within a business," says Pichler. "We could see that we were wasting money." Still, some executives resisted, worried that correcting the misstep would damage the company's reputation for dependable growth year after year. After all, Server Beach was expanding so quickly that it was generating $7 million, or nearly 10 percent of the company's total revenue of $77 million, in 2003, its first year in business. These days Rackspace is a buzzing hive of commerce. On the sales floor, young staffers work the phones, reeling in customers. Down the hall, 30 new recruits are racing through a week of corporate boot camp, eager to finish up and get in on the action. In the basement, the snack room has been converted into makeshift offices for six new salespeople soon to be dispatched to open a satellite office in Austin. With a hiring spree adding 70 new employees a month to a roster of 1,100, Rackspace is bursting at the seams. So isn't it time for some new digs? How about a room with a view for Weston, who at the moment is crammed molelike into one of a warren of dull, gray, windowless offices? Weston winces at the thought. "Not yet," he says. "Not until the last ... possible ... moment." Does your company use a true profit business model? Tell us about it.